Here is a story that deserves to be shared. Sammy Kanja is a founding member of Zidisha’s community in Kenya. He used his earliest loans to purchase a donkey cart and donkeys for his goods transport business. The proceeds from this business enabled Mr. Kanja to return to secondary school, something that had not been possible in his youth due to financial constraints. 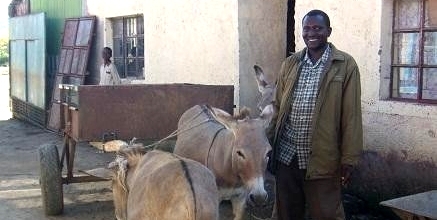 Mr. Kanja has maintained a 92% repayment rate over the course of four years of participation in Zidisha’s online microlending community, using the profits from the loans to grow his donkey transport business and diversify into dairy farming. Two years ago Mr. Kanja’s wife gave birth to twins. Mr. Kanja redoubled his efforts to grow his business assets, looking forward to acquiring high-quality educations for his children with the increased income. Mr. Kanja also serves as a Volunteer Mentor, assisting other Zidisha members in Kenya to interact with our online community. In October last year, we lost contact with one of the members he had helped, Mr. Fracis Kiiru. After several unsuccessful attempts to call, Mr. Kanja went to visit Mr. Kiiru’s home and discovered that Mr. Kiiru had been injured during the Westgate Mall shootings in Nairobi and had been hospitalized. Mr. Kanja and his wife decided to sell the two donkey carts and the dairy cow that had been the source of their family’s financial well-being, in order to pay for medical treatment of Mr. Kiiru and of a relative whom they also discovered among the injured. “I used the money to tranfer hime to the private hospital for farther treatment,as i am writing to you,he is in good condition and i am expecting to take him to his sister on wenesday as per the doctor,” wrote Mr. Kanja. Mr. Kanja could have gone home quietly, telling himself that there was nothing he could do to help. Instead, he traded his business assets, the source of his family’s livelihood and hope for a better financial future, to procure life-saving medical care for others. Mr. Kanja may not look extraordinary and he will probably never be on the cover of a newspaper. For me, though, he is a hero. This story has a happy ending. When Mr. Kanja’s story became known among Zidisha lenders, they decided to help, spreading the word to other lenders in our forum and collecting donations on his behalf. Inspired by Mr. Kanja’s selflessness, even members who had never lent to Mr. Kanja contributed. Ultimately, they raised enough to cover the cost of a new high-yielding dairy cow for Mr. Kanja’s family. Mr. Kanja tells us that the new cow is extraordinarily productive, yielding as much as 20 liters of milk per day. He keeps two liters for his family and sells the rest each day, generating a comfortable flow of cash for school fees and other family expenses. This is an updated version of a blog post originally published in October 2013. Posted on December 28, 2014 by Julia Kurnia. This entry was posted in Uncategorized. Bookmark the permalink.